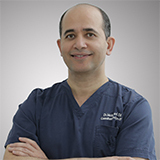 Dr. Mohamed El-Said Eid, Consultant IVF, OB/GYN, has over 15 years of clinical experience in IVF and OB/GYN. He received his medical degree from Cairo University in 1997 where he has been a professor of Obstetrics, Gynecology and Infertility for more than 10 years. Concurrently, since 2000, he worked as a Senior IVF Consultant in Saudi Arabia at a medical center that completed 1000-1500 IVF cycles per year. While there, Dr. Eid designed the policy for prediction and management of Ovarian Hyper-Stimulation Syndrome and introduced the usage of 3D-Ultrasounds in their infertility work-ups. In addition, he modified the ovarian stimulation protocol and set up their PGD program. He is an expert in the field of gynecological endoscopy, with many years of experience in performing both laparoscopies and hysteroscopies. Dr. Eid’s specializes in treating recurrent miscarriages and fetomaternal medicine. He has 19 publications in scientific journals. Membership: American Society of Reproductive Medicine, European Society of Human Reproductive Endocrinology and Middle East Fertility Society. Education: Dr. Eid received a MBBCh degree with honors from Cairo University in 1988. He continued at Cairo University, receiving his M.Sc. of Obstetrics and Gynecology and MD of Obstetrics and Gynecology in 1997.